Photo: Wombats can be found in Tasmania and various parts of continental Australia. Native fauna of Australia, wombats can still be found living in the wild in various parts of the country, primarily on the south east coast as well as including Tasmania and other smaller islands. These marsupials have a backward pouch for carrying their young. The backward pouch is to prevent dirt from entering and covering up their young as they like to burrow, helped by their rodent-like front teeth and very powerful claws. As pets: They are not suited to be pets, they are strong and determined creatures and their claws are sharp. They also like to burrow and forage extensively and they, like many other native animals found in Australia, are nocturnal. It may just be a whole lot simpler to buy a stuffed toy animal. They are also protected under Australian law. Efforts are being made to help the surviving populations of wombats scattered around the country. Zoos and animal sanctuaries contribute greatly to this work, these are probably the best places to see them. If your lucky they may have some very friendly ones that you can pet up close. As they can forage at night, roads have become very hazardous as more and more of them are built. If people are not driving carefully in parts of the country, they can be hit by cars, causing extensive damage to the car as well as them. Within the park, there are resorts, motels, cabins and camping grounds available. For Hotels throughout Australia and other accommodation, see Hotels in Australia. 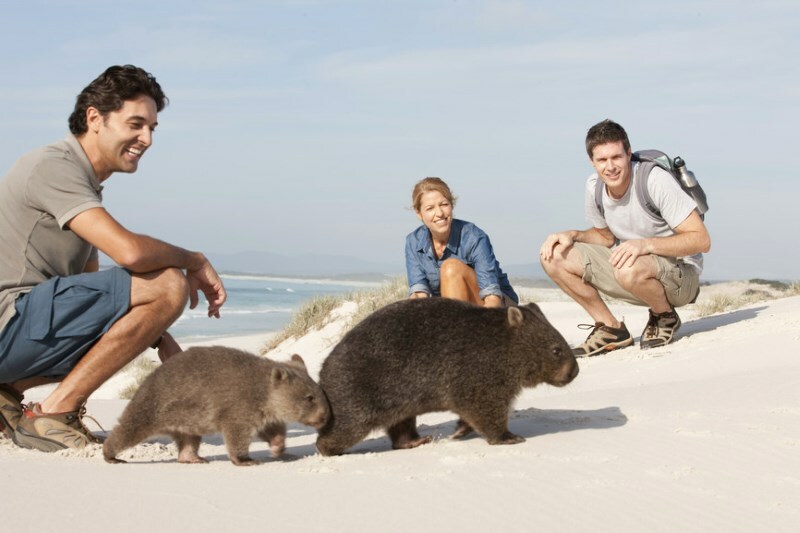 Main Photo: Wombats can be found in Tasmania and various parts of continental Australia.